ALL my sites were shut down because a few of them were hacked. So not only did it mean cleaning up the sites but I also moved all my sites to a different host with a different philosophy and support level.. Now this demanded that either I start devoting more time to my neglected sites or rethink this blogging thing. So as I take this journey of rediscovery and focus I thought I would go back to some basics to reinforce them not only for myself but perhaps others who, like most of us baby boomers visit the dramas of LIFE on a daily basis.and must make priorities..
What is the Plan or Purpose of your Blog? 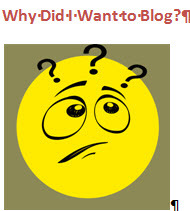 As I visit each blog to determine if it stays or goes away to blog heaven I am revisiting why I started the blog. I am also rethinking who my audience is, how often I will post and why I am devoting time to post to the site. It must have a purpose. I challenge you to use this chart as a guide to help you answer some of these questions for each and every one of your blogs. Let me know how you are doing.. Consider re-evaluating your blogs by answering these questions. ← Which Goes First the Chicken or the Egg, The Picture or the Blog Post?